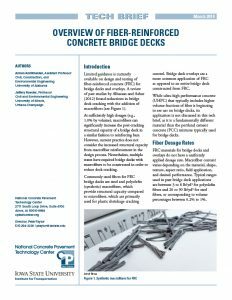 Limited guidance is currently available on design and testing of fiber-reinforced concrete (FRC) for bridge decks and overlays. Nevertheless, multiple states have required bridge decks to be constructed with macrofibers in order to reduce deck cracking. 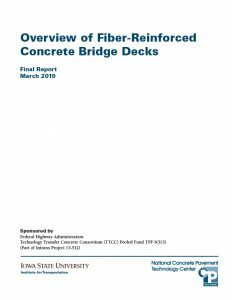 A new report and tech brief issued by the National Concrete Pavement Technology (CP Tech) Center summarize laboratory and field performance of various FRC bridge decks and concrete overlays. In addition, another tech brief explains how to determine the appropriate fiber reinforcement performance values to specify and implement in the structural design calculations for bonded and unbonded concrete overlay projects using a tool developed as part of the project. The spreadsheet tool called the Residual Strength Estimator will help pavement engineers use FRC in concrete pavement applications. 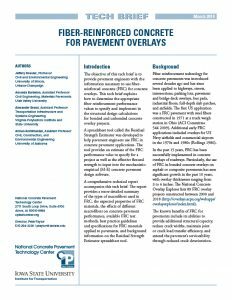 The tool provides an estimate of the FRC performance value to specify for a project, as well as the effective flexural strength to input into the mechanistic-empirical (M-E) concrete pavement design software. The project, which is still ongoing, is sponsored by the FHWA Technology Transfer Concrete Consortium Transportation Pooled Fund. CP Tech Center Associate Director Steven Tritsch is the principal investigator on the project and center Director Peter Taylor is co-principal investigator. The report and tech briefs were authored by Jeffery Roesler, a professor at University of Illinois Urbana-Champaign; Armen Amirkhanian, assistant professor at University of Alabama; Amanda Bordelon, assistant professor at Utah Valley University; and Alexander Brand, assistant professor at Virginia Polytechnic Institute and State University. A project overview and the publications are available here.